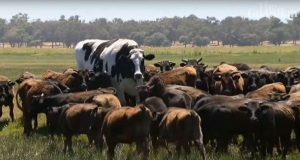 Photos of “Knickers” have gone viral online: he’s a “giant” 6-foot-4-inch steer from Australia. 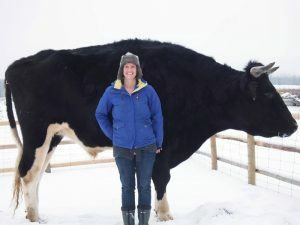 But Kismet Creek Farm in Steinbach, Man., Canada, has a bigger one: a 6-foot-6-inch tall steer. “Everybody is pretty much smaller than Dozer,” owner Karl Schoenrock said. “Even our horses and everything else, nothing compares.” Dozer’s previous owner, a vegan, had dealt with Dozer breaking out to spend time at a nearby beef farm. “So she found us and wanted to bring him here so he could live out the rest of his days with his friends that wouldn’t go for food,” Schoenrock said. Dozer now shares a pasture with — and towers over — two other steers, and a horse. Schoenrock said visitors can see Dozer and the other animals on weekends when the farm hosts a petting zoo, where the admission fee goes toward taking care of the rescued animals. (MS/CTV) …We hope Australians don’t get their Knickers in a twist. As someone who eats beef grown across the (dirt) road from me, I was less impressed. If allowed to grow, uncastrated Holstein bulls can easily reach 6 feet and 2,500 lbs. ; steers grow larger than that — that’s why they castrate them. So what is this all really about? Simply, it shows just how out of touch people are from the food they eat. People who have no idea this is normal get others to say “Wow!” about …something normal. Humans feed animals to be bigger to bring more money at market, so it’s a surprise when they get big when they’re not killed because…? Because most of us are so freaking ignorant. Hell: isn’t that why everyone was calling Knickers a “cow” (female) when he’s a steer (male)?! If you fell for it, here’s some consolation: giant steers really are rare …but only because almost all are killed for McDonald’s once they reach 15 months. It really is as simple as that. Thanks once again for making me feel stupid. I mean educating me. Finally, a voice of reason. My cattle growing friends all laughed at that “viral” story. After all, Paul Bunyon’s Big Blue is a lot larger than that! LOL! When I first read about Knickers and realized what types of cattle were in the picture, I thought about Dorothy in Munchkin Land. Judy Garland was not tall, but she was a giant compared to her little people costars. This city slicker appreciates the clarification. Sure, I’ve been all over the country and I’ve seen plenty of cattle (and, like most city slickers, I let out an imitation moo when I see them), but you lose touch with sizes even riding through ranch country. I saw a clickbaity thing a couple months back, which (according to the headline) featured a ‘massive’ crocodile crossing a road. It was a normal sized crocodile. I’ve been wondering ever since what made it a massive crocodile. I’ve been wondering ever since what made it a massive crocodile. For example, the better known Kobe beef is one of the more famous versions of wagyu. Wagyu is often named after the region it was raised. Wagyu is considered the most tasty and expensive beef available — due to the fineness of the meat, and the marbling of the fat. (NOT more fat).